The new detached homes could fetch more than $100 million combined, though the Laurelhurst development is not a slam-dunk: Past proposals at the site have failed in the face of community opposition. For the first time in decades, a large, new private single-family-home community has been proposed in Seattle, as a local developer hopes to transform one of the city’s last big private swaths of untouched land to take advantage of the red-hot luxury-home market. 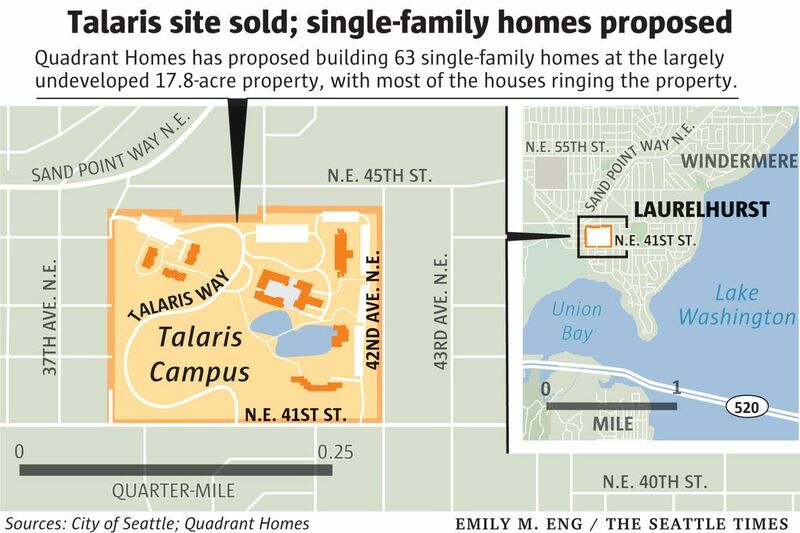 Quadrant Homes has agreed to buy the 17.8-acre Talaris site in Laurelhurst, between the University of Washington and the Seattle Children’s complex, described by locals as a quiet, parklike “oasis.” The property now holds a small conference center and lodge, but most of the property — which is closed to the general public — is open green space and ponds. Quadrant, now a Bellevue-based unit of California’s TRI Pointe Group, has proposed building 63 single-family homes on large lots that homebuilders estimate could sell for about $2 million each. Its plan would keep some of the existing buildings and park space. 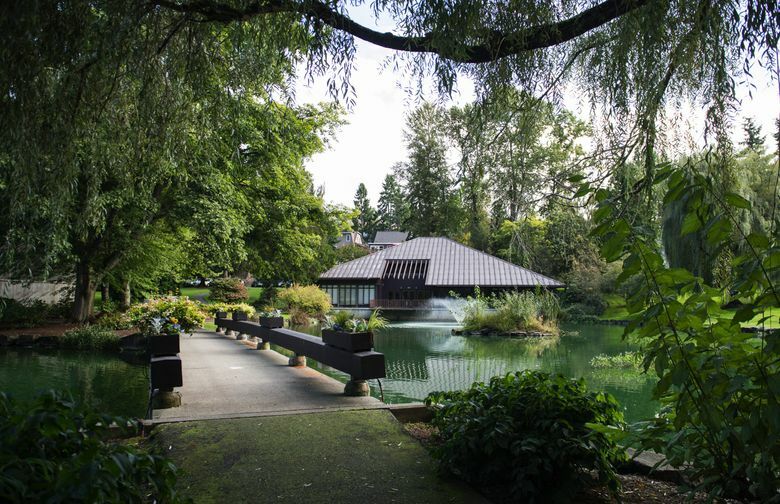 But it won’t be easy money: Laurelhurst neighbors concerned about development have sued over previous projects in the area, and the normal city-approval process could be complicated by historical landmarks at the site. If Quadrant’s plan is approved, it would likely be several years before any of the new homes could hit the market. City officials said they could not identify a private single-family development of this size in the city in at least decades (though the Seattle Housing Authority has built public housing in other areas of the city). And homebuilders say there is likely no other single site available for future single-family home projects of this magnitude. Most of Seattle consists of neighborhoods with detached houses and yards, but those largely were built generations ago. More recently, a record construction boom has transformed the city with apartments and offices, and several neighborhoods have been rezoned, with more to come, to allow for taller buildings and more density. The proposal, a rare large-site development opportunity, is sure to spark a debate as city officials are encouraging more dense housing. But the site is zoned for single-family homes, and it sits next to other streets lined with detached houses. Past proposals to rezone the area and build apartment towers there failed in the face of opposition from neighbors. 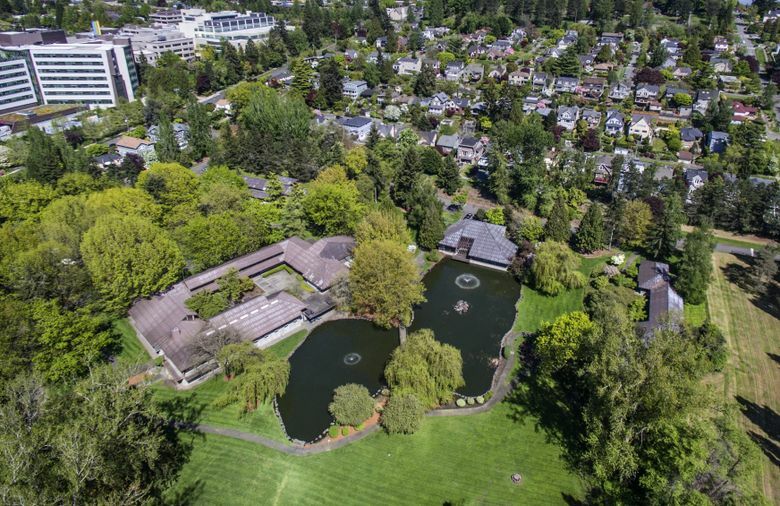 And part of the Talaris site, originally built for the Battelle Memorial Institute in the 1960s, is protected by historical designations, as it was designed by Richard Haag, who also designed Gas Works and Victor Steinbrueck parks. “We consider it to be one of the last really great vestiges in Seattle,” said Ken Krivanec, president of Quadrant Homes. The property is owned by a company linked to telecom billionaire Bruce McCaw. There is no timeline for construction, nor have detailed renderings or plans been submitted. The developer has had initial meetings with the Laurelhurst Community Club, an active neighborhood group that keeps close tabs on development there, and the city’s Landmarks Preservation Board, which has jurisdiction over projects where historic properties are located. Neither group has weighed in on the project. The community club’s president, Jeannie Hale, said the group has gotten only a broad overview of the plans and it anticipates a rigorous review of the full proposal. Residents who spoke at the initial landmarks board meeting this week were reportedly “negative, but polite” about the plans, while members of the historical board were not necessarily opposed to the project, according to the Seattle Daily Journal of Commerce. Bonnie McGregor, executive director of a cancer-care center at Talaris named the Orion Center for Integrative Medicine, said the development would be “devastating.” In addition to the patients served there, wildlife on the grounds includes an eagle’s nest, coyotes, deer, migratory ducks and great blue herons. “It just seems like there’s so little green left in Seattle,” McGregor said. “It’s amazing to me that they’re even contemplating this. Neighbors and some of the on-site business and nonprofit operators had hoped to put together a bid to buy the property but fell well short of the tens of millions of dollars needed for a competitive bid. Even with the challenges for developing the property, the Talaris site (named for the Talaris Research Institute, which was sold off in 2012), drew intense interest when it hit the market because of the potential for homebuilders to turn a large profit. The single-family home market in Seattle has been the hottest in the country for more than a year. In the Laurelhurst area, the average home now goes for $842,000. But brand-new homes carry an even bigger price tag. Homebuilders surveyed for this story said the houses at the Talaris site would likely fetch $1.7 million to $2.5 million today; it would be years before they could actually hit the market. That’s because of the sought-after neighborhood, and the fact that the lot size — which averages 5,500 square feet — figures to produce four-bedroom homes that exceed 2,500 square feet, which are big homes by Seattle standards. Total revenue from the home sales could exceed $100 million. Quadrant itself hasn’t yet disclosed any data on expected home sizes or prices for the development. The detached homes would be built between Northeast 41st and Northeast 45th streets, with access through private roads. Early design drawings show the homes ringing the perimeter of the block. In the middle of the site, an existing conference center and four other buildings would remain, along with two ponds. Two other small buildings would be removed. “We want the houses to kind of hide in plain sight,” Krivanec said. Quadrant has hired high-powered land-use attorney Jack McCullough and has begun outreach with the one of the site’s original architects, Bob Hidey. Although the project would be a big change for the property, the proposal is less intensive than it could be. The area is zoned for as many as 80 or more single-family homes, but Quadrant said it was a conscious decision to keep some of the greenery at the site intact. “We appreciate how the landscape integrates with the entire aesthetic of the property. So the plan would be to retain that,” said Bonnie Geers, senior vice president of community development for Quadrant. While homebuilders still build the occasional tract communities out in the suburbs, built-out Seattle doesn’t offer those opportunities. A development called Briarcliff in Magnolia was the last big one — that totaled about 30 luxury homes roughly 10 years ago, city development officials said. Seattle has had a net increase of about 5,300 single-family homes since 1996, or about 240 per year, with most of the homes being built one or two at a time. By contrast, Seattle has been getting more than 5,000 new apartments per year over the last few years. The 63 homes proposed in Laurelhurst, while likely not affordable, would be a significant boost for overall for-sale inventory at a time when the city has a record low number of homes for sale. The entire Northeast Seattle market had 24 houses on the market at the end of December.